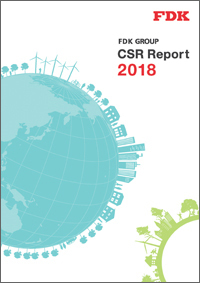 The "FDK Group CSR Report" is published so that all of our stakeholders will understand our various activities based on the CSR Policy of the FDK Group. The "FDK Group CSR Report" reports our CSR activities under "Seven Prioritized Initiatives” defined by the FDK Group. Please see here for the Environmental Report that we issued in the past. This document is prepared in PDF format. To see the document, you need to install Acrobat Reader. "Back number of the FDK Group CSR Report"